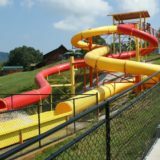 Family camping resort offering a water slide, spray playground, jumping pillow, canoeing, and tubing! Tent sites, large pull-thru sites and deluxe cabins. Children Welcome, Pets Welcome, Playground, Pool, Laundry, WiFi.